As mentioned previously, Otatakan lake is fed by four rivers and emptied by one. Eventually, all the water in that area ends up in Hudson bay. We chose a river that entered the lake along the south shore for a days exploration and it would turn out to be an excellent day trip. We had fished near the mouth of the river and caught a lot of walleyes there. Heck. We caught a lot of walleyes everywhere, but that spot stood out. 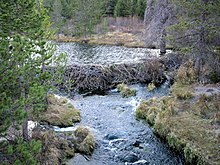 We started out heading up the river and after a few twists and turns, we came to a beaver dam. It wasn't that high, only about a foot or so off the water. Mom said it was too bad and we'd have to go somewhere else. Chris and I had other ideas. We drove up close and picked a spot where the water was deep on the other side of the dam. Then we backed up. Chris came to the rear of the boat with me―I mean right onto the back seat next to me. The bow of the boat was about 2 1/2 feet off the water. I gunned the motor and headed straight for the dam. I remember catching a glimpse of my mother's wide open mouth, but I didn't have time to grin at her. Unknown to either her or my dad, we had done this before in the lakes back in the states and it was a well rehearsed operation. The bow hit the dam and the boat slid up on it. Chris ran to the bow while I shut the throttle down to idle and tilted the motor up at the same time. The boat seesawed, and the motor prop spun free out of the water as I stepped forward. Then just as planned, the boat tilted and slid into the water on the other side of the dam. I dropped the motor back in the water and we were ready to go. Mom said, "I'm not doing that." Well, I wondered if they would try. Dad drove up alongside the dam and held onto it. Mom got out, steadied herself and waited. Dad backed off, drove onto the dam and lifted the motor. After he pushed the boat into the water on the other side, Mom got back in the boat and we were ready to go. Not exactly exciting... but sensible and effective. We worked our way slowly through the beaver pond upstream from the dam. Beavers never stop chewing and there were plenty of logs, sticks, branches and other things above the dam. We didn't catch any fish, but the scenery was great. It wasn't long and we came to dam number two which we crossed the same way. Then dams number three, four and five. Once we were above dam five, we came to another dam that huge. It had to be five feet above the water and as long as a football field or more. There were seven beaver houses in that pond. We looked around for a while and were getting ready to leave when Chris and I found a stream nearly hidden by overhanging brush. We consulted the map and discovered the high dam was not damming the water on the river we were on, but on a stream that connected to the river. The stream in the overhanging brush was the river! You'd have thought someone had announced free beer. Chris and I were almost rejoicing that we could go further. I think it was because the day's adventure was not over with yet. We motored slowly. The stream was about three or four feet deep and slowly narrowed. Mom and dad followed us of course. Slowly however, the stream was narrowing and becoming more shallow. Eventually, we had to stop. Up ahead, we could hear the sound of water going over rocks. Curious, Chris, Autumn (yeah, she still trusted us enough to ride along) and I left the boat and made our way on foot. The bugs were just plain awful up there. Black flies and mosquitoes were a continuous and constant annoyance. There were so many that in spite of copious amounts of bug dope, they were still biting us. We came to one of the few stands of hardwood trees we saw in the area. It was perched on a small knob of a hill around which the stream flowed over some rocks. About then, Dad yelled to ask what we found. Chris yelled back to stay where they were. No sense in them coming up there for nothing. The sound of water we heard was just a few couple feet worth of rocks and the stream had narrowed to a few feet and about eight-inches deep. Chris and I poked around for a minute and you could tell the stream's origins were in that little hill, but we couldn't find exactly where because of the brush, downed trees and the damn black flies. You had to constantly swat at the back of your neck and brush them off your arms. We were about to leave when Mom and Dad came walking up the stream. Instead of struggling through the brush and downed trees, they just walked up the stream. Sure they got their feet wet, but so what? They did not stay long however, and we didn't either. We all wanted out and away from the black flies. We made our way back down the stream. Jumping beaver dams going down stream is only half the fun of going up stream, but it is still fun. It was probably about five in the afternoon when we reached the river mouth. We stopped to fish for dinner, knowing it would not take long. There was a curious thing going on there. Over in some shallow water there was a lot of splashing and the water was swirling around. Dad made some comment that it was probably an injured fish or something. They only stayed in the river a little longer and left to go back to the cabin, but Chris and I were going to keep fishing. After they left, we were catching walleyes hand over fist again and quite honestly, we were just a bit bored in spite of the amazing fishing. And, the splashing in the water didn't look like an injured fish to me. There was just too much splashing and roiling water for that. I took my jig off the line and put something else on. I can't remember what, just that it was an artificial lure. I cast my line over there and started to reel it back. Immediately a fish hit it and I reeled in a decent sized northern pike. Chris switched lures before I got the fish to the boat. We started catching northerns like crazy. I put on a floating lure and tried that. When you reel in a floating lure, you can see it coming on the surface of the water. In this case, you could see the lure coming back, then a wake would appear behind the lure. There was a surge of water and a mouth would open to engulf the lure and you had a fish on. We tried every sooner lure (lures you'd "sooner" lose to a log than just throw away and admit you'd spent the money on it foolishly.) we had and they all worked. All of them. All except a piece of junk we'd been talked into buying called a Lac Seul ( pronounced soo-l ) Spinner. It was getting late and I mean really late. The sun had set and that meant it was well past time to be getting back. Reluctantly, we left the river and went back to the cabin to tell Mom and Dad about the feeding frenzy of fish they had missed out on. Back at the cabin, I hung a Lac Seul Spinner on a rafter and wrote my own graffiti next to it. "The Lac Seul Spinner is the worst tourist bait I ever bought. Even the northerns won't bite on it." You remember how we almost went over the rapids/waterfall? Well come back next week and I'll you how Chris and I did end up going over a different rapids/waterfall in the boat while Autumn―smart dog that she was―watched from shore.